Abstract: China has advocated a new theorem of great power diplomacy under the “New Silk Road” Strategy. Wherein, the center of gravity lies in the creation of an economic land belt and a maritime road that connects Asia, Africa, and Europe. In this view, China’s mammoth initiative of reviving the historical Silk Road appears as the creation of a new world order that challenges the existing status quo of the United States dominated Western global order. It also marks a major shift in China’s foreign policy, as it significantly draws from its domestic pursuit of the “Chinese Dream”. Thereby, it can be rightly stated that this strategic move characterizes “China’s Rise” both as a regional as well as a global power defined by “Chinese characteristics” -- wherein, China is making new rules to play the game of global power politics. The twenty-first century of international politics is often dubbed in the rubric of “China rise”, as the epicenter of global politics is said to be anchored in the expanding political and economic clout of the People’s Republic of China (PRC). In this stage of metamorphosis of the international system resulting into the gradual shifting of the balance of power from the West to the East, the world seems to watch the dragon’s (China) dance in the east. That is, China’s growing assertive posture in the South China Sea and East China Sea and so on, but the dragon seems to be looking the other way towards the West -- in defining new contours of its global power politics. The PRC, under the command of its supreme leader President Xi Jinping, aims to fulfill the grand vision of the “Chinese Dream” by realizing the “great rejuvenation of the Chinese nation.” The ambition lies in realizing the twin centenary goals: first, to double the 2010 GDP per capita income and build a moderately prosperous society by 2021, when the Communist Party of China marks its 100th anniversary; and second, to turn China into an all-around modern and socially advanced country by 2049, when the People’s Republic marks its centenary (Deepak, 2014). “To forge closer economic ties, deepen cooperation and expand development in the Euro-Asia region, we should take an innovative approach and jointly build an ‘economic belt’ along the silk road. This will be a great undertaking benefitting the people of all countries along the route”(Ibid). Later, the initiative for building the “road” was proposed by Xi in his October speech before the People’s Representative Council of Indonesia in order to promote deepened economic and maritime links. In addition, Xi also publicized the idea to establish the Asian Infrastructure and Investment Bank (AIIB). 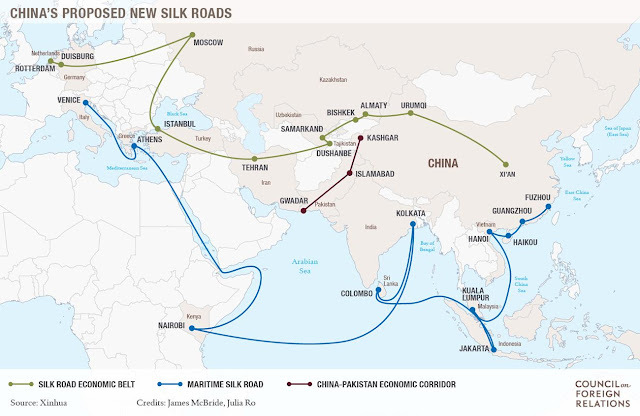 This mammoth conception of creating a “New Silk Road” via land and sea routes entered the stage of practical operation in 2014 with Chinese Premier Le Keqiang’s call for the “intensification of the planning and building of a Silk Road economic belt and a 21st century maritime Silk Road” in the Report on the Work of the Government (p.17) as delivered in the 12th National People’s Congress on 5 March 2014. Later that same year, the initiative gained momentum with 21 Asian countries signing the Memorandum of Understanding on Establishing AIIB, as founding members on 24 October 2014 in Beijing, followed by President Xi Jinping’s proclamation in November 2014 that China would contribute $40 billion to set up the Silk Road Fund to improve the trade and transport links in Asia (Page, 2014). In January 2015, the New Silk Road initiative gained further intensification with the increase in AIIB members to 26. Then, in March 2015, and despite opposition from the US, Britain became the first Western country to apply to join the AIIB as a Prospective Founding Member (PFM). This gave way to other major Western countries (France, Italy, Germany, and Australia) joining also. With the growing popularity of Xi’s visionary idea of connecting Asia to Europe, a “historic step” was taken forward in Beijing on 29 June 2015 as the framework Agreement for the operations of the Chinese-led AIIB was officially signed by 50 PFMs -- which aims for $100 billion in initial capital (Tiezzi, 2015). With this succession of events, it is clear that China’s “One Belt, One Road” strategy is treading on a real path with a pragmatic approach. This exemplifies China’s aspiration to become the geopolitical and geo-strategic center for contemporary international politics. The objective behind China’s “One Belt, One Road” strategy can be understood in the systemic challenges that restrict China rise as a global player on the international stage. This can be assessed in the growing security and strategic threats that severely challenge China’s great power politics syndrome. China is attempting to implement this new assertive external posture as its historically rapid economic growth slows, which threatens the stability of the country. The nation has also faced energy insecurity, and economic and domestic instabilities caused by Uyghur separatist actions in Xinjiang and other areas. Despite these internal woes, China’s main concern revolves externally around the “US-factor”, whereby, China faces a severe challenge to its expanding influence in the east by the United States’ “pivot to Asia” policy, as the US and its allies (e.g., South Korea, Japan, Taiwan, Philippines, Australia, and India) aim to contain China in the Asia-Pacific region. For instance, US-driven trade agreements, such as the Trans-Pacific Partnership (TPP), Transatlantic Trade and Investment Partnership (TTIP), and the EU-Japan agreement show comprehensive liberalization agendas that exclude China. This exclusion clearly outlines the US objective of containing China (Chi, 2015). In response to US trade policies, China, with its “One Belt, One Road” initiative, plans to negotiate free-trade agreements with 65 countries along the One Belt, One Road periphery. In addition, China-led AIIB is seen as the Chinese effort to undercut the dominance of Western economic institutions like the World Bank and the International Monetary Fund; thereby, defining new rules in the international system. Thus, in this view, Xi Jinping’s “One Belt, One Road” initiative provides a strategic survival tactic for China. What lies at the core of these policies is the key interest to fulfill its national security agenda by securing and safeguarding its economic growth through expanding its interest to the West; thus, further legitimizing the Chinese Communist Party’s rule in China. Therefore, China’s “New Silk Road” initiative aims for a win-win cooperation that promotes common development and prosperity and a road towards peace and friendship by enhancing mutual understanding and trust, and strengthening all round exchanges. China’s “New Silk Road” is mainly a two-pronged strategy. The first focuses on the overland infrastructure development through Central Asia -- the “Silk Road Economic Belt”, while the second forces the expansion of maritime shipping routes through the Indian Ocean and the Persian Gulf –- the “Maritime Silk Road” (McBride, 2015). What is important to note is, that by financing railways, roads, ports and power lines, China wants to build its good neighborhood policy through geo-economics and thereby, contribute towards a bolsting China’s economic growth and development, making China Asia’s leading investor as well as financier. In this view, by adopting such a strategy, China seeks to streamline foreign trade, ensure stable energy supplies, promote Asian infrastructure development, and consolidate Beijing’s regional role (Ibid). “a way for win-win cooperation that promotes common development and prosperity and a road towards peace and friendship by enhancing mutual understanding and trust, and strengthening all-round exchanges. The Chinese government advocates peace and cooperation, openness and inclusiveness, mutual learning and mutual benefit” (National development and Reform Commission, 2015). That is, China stands for absolute gains over relative gains by means of One Belt, One Road. Here, the key to “One Belt, One Road” lies in the development of an unblocked road and rail network between China and Europe. In doing so, the plan involves more than 60 countries, representing a third of the world’s total economy and more than half of the global population. The “Silk Road Economic Belt” comprises of a land route that focuses on bringing together China, Central Asia, Russia, and Europe (the Baltic); linking China with the Persian Gulf and the Mediterranean Sea through Central Asia and West Asia; and connecting China with Southeast Asia, South Asia, and the Indian Ocean. Map Attribute: Maritime Insight 2015, 10. In this light, the Chinese initiative aims to jointly build a new Eurasian Land Bridge and develop the China-Mongolia-Russia, China-Central Asia-West Asia, and China-Indochina Peninsula economic corridors by taking advantage of international transport routes, relying on core cities along the Belt and Road and using key economic industrial parks as cooperation platforms (National Development and Reform Commission, 2015). The “Belt” will be a network comprising of rail routes, overland roads, oil and natural gas pipelines, and other infrastructure projects. It will stretch from Xi’an in central China, through Central Asia, and ultimately reach Moscow, Rotterdam, and Venice (Maritime Insight, 2015, 10). With its land-route strategy, China aims to benefit by building a better economic connectivity that will fulfill China’s own domestic objectives. Additionally, China wants to enrich its underdeveloped border regions through the creation of new trade zones in order to avoid ethnic tensions, such as, the separatist and terrorist activities in Xinjiang. Funding from the $40 billion Silk Road fund, the AIIB, the BRICS New Development Bank (NDB), and China’s policy banks will finance the infrastructure buildup along the land route. The 21st-Century maritime Silk Road is designed to go from China’s coast to Europe through the South China Sea and the Indian Ocean in one route, and also from China’s coast through the South China Sea to the South Pacific. The “Road” is a maritime network of port and other coastal infrastructure from South and Southeast Asia to East Africa and the northern Mediterranean Sea (Ibid). Map Attribute:Maritime Insight 2015, 11. In its trajectory, the Maritime Silk Road (MSR) begins in Fuzhou in Southeast China’s Fuzhou Province, heads south into the ASEAN nations, crosses the Malacca Strait, and turns West to countries along the Indian Ocean before meeting the land based Silk Road in Venice via the Red Sea and Mediterranean. Under the ambit of MSR, China plans to build hard and soft infrastructure from Indo-Pacific to Africa, including transport, energy, water management, communication, earth monitoring, economic, and social infrastructure (Deepak, 2014). With this sea-route strategy, China has already financed new ports in the Indian Ocean in Bangladesh, Pakistan, and Sri Lanka. While the primary focus is mainly to seek commercial benefits, China is also building up its naval power in order to safeguard its maritime trade routes. Most importantly, the sea route will serve China’s core interests in the South China Sea, where China faces a severe threat -- the “Malacca Dilemma”, at the Straits of Malacca -- a strategic choke point to China’s free flow of trade and energy supplies along the Sea Lanes of Communication. In this light, at sea, the initiative will focus on jointly building smooth, secure, and efficient transport routes connecting major sea ports along the Belt and Road. In this case, the China-Pakistan Economic Corridor (CPEC) and the Bangladesh-China-India-Myanmar Economic Corridor are closely related to the Belt and Road Initiative (National Development and reform Commission, 2015). China’s sea route buildup has taken roots with the financing of $46 billion investment in Pakistan, building the 3000 km long CPEC from the Arabian Sea to Xinjiang in northwest China; wherein, the route will begin in Gwadar. 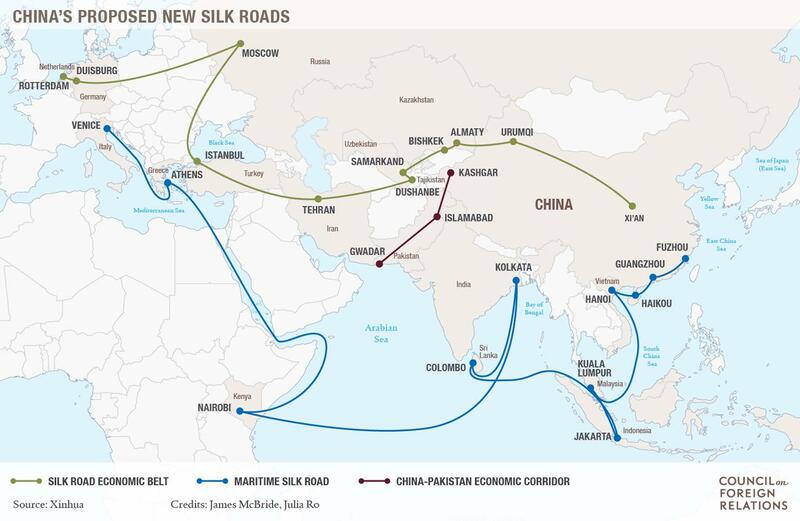 Therefore, the “21st Century Silk Road” is to build new port infrastructure that links to inland transport networks, increase the number of international sea routes, improve logistics (including through enhanced usage of information technology), dismantle trade and investment barriers, and deepen financial integration by greater use of the renminbi (Chi, 2015, 6). Jash, A. China’s “New Silk Road” Strategy: “Belt” versus “Road””, International Affairs Forum on “A World on the Move: Migration and Statelessness”, Volume 1, Issue 1, Winter 2016, Washington DC, pp. 116-123. 1. Chen, Dingding. “China’s ‘Marshall Plan’ is much more.” The Diplomat, November 10, 2014. 2. Chi, Lo. “China’s “One Belt One Road”: The Land and Sea Strategies (Part 2 of 2).” BNP Paribas, July 8, 2015. 3. ——. “The economics and politics of China’s New Silk Road.” South China Morning Post, June 30, 2015. 4. Deepak, B.R. “One Belt One Road: China at the Centre of the Global Geopolitics and Geo-economics.” South Asia Analysis, Paper No. 5838, December 4, 2014. 5. Li, Keqiang. “Report on the Work of the Government.” Delivered at the Second Session of the Twelfth National People’s Congress, March 5, 2014. 6. McBride, James. 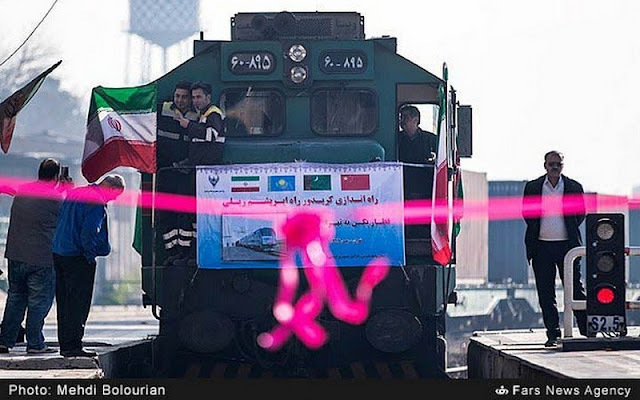 “Building the New Silk Road.” Backgrounder: Council on Foreign Relations, May 25, 2015. 7. National Development and Reform Commission, Ministry of Foreign Affairs, and Ministry of Commerce of the People’s Republic of China. “Vision and Actions on Jointly Building Silk Road Economic Belt and 21st-Century maritime Silk Road.” March 28, 2015. 8. Page, Jeremy. “China to contribute $40 billion to Silk Road Fund.” The Wall Street Journal, November 8, 2014. 9. Shi, Zi. ““One Road & One Belt” New Thinking With Regard to Concepts and Practice.” Lecture delivered at the 30th anniversary of Conference of the Schiller Institute, Germany, October 14, 2014. 10. “The Memorandum of Understanding on Establishing the Asian Infrastructure Investment Bank (AIIB) was signed in Beijing.” AIIB, October 24, 2014. 11. “The One Belt, One Road Initiatives.” Maritime Insight, Issue 1, June 2015. 12. Tiezzi, Shannon. “The New Silk Road: China’s Marshall Plan?.” The Diplomat, November 6, 2014. 13. ——-. “‘Historic’ AIIB Signing Marks Beginning of New Era, China Says.” The Diplomat, June 30, 2015.